Living Air ionizers, Living Air air purifiers, Ecoquest air purifiers, Better Living air purifiers, Alpine air purifiers. What do all of these have in common? They are all part of the same company! That's right, each of these are part of the same company. Living Air ionizers, Living Air air purifiers, Ecoquest air purifiers, Better Living air purifiers, Alpine air purifiers. Let's begin with a little history. Alpine Industries was based in Minnesota. They were a multi-level marketing company that produced and sold air purifiers. Nothing sinister in that. They got in a mess over their advertising. It seems that they were using unsupported health claims. The Minnesota Supreme Court ruled that Alpine could not keep claiming there machines would help ease the symptoms of certain medical conditions. They also could not claim to effectively remove air particles. Alpine Industries moved to Greeneville, Tennessee in 1997. In 2000, Ecoquest International bought and took over Alpine's air purifier division. Ecoquest was headed a former sales manager of Alpine. Ecoquest is also headquartered in Greeneville. It continued as a MLM company. It expanded to include other health products. It claimed to have as many as 150,000 independant dealers. Now the leadership has changed again. It is being run by Joseph Urso. The name has also changed to Vollara. Will the company's reputation rebound? It is too early to tell. We have to wonder whether the main concern of the company and its dealers is providing a high quality product or trying to make commissions. 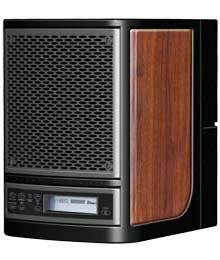 It is really hard to find any real information about Living Air Ionizers or Alpine Air Purifiers or Ecoquest FreshAir air purifiers or WHATEVER they are being called now. Do an internet search on any of these names and all that seems to come back is "testimonials" from dealers. What are the facts? These air purifiers are nothing more than ozone generators and ionizers. They operate by producing negative ions. These negative ion supposedly roam around the air in your house removing particles from the air. As all our regular readers know, we do not like stand alone ionizers. We think that the can work well if they are used together with a HEPA filter. These air purifiers can operate in three modes. Normal mode that relies mostly on negative ions. It still produces ozone but not as much. High mode that adds ozone, called activated oxygen, to the air. Away mode that releases a lot of ozone. Living Air Ionizers also produce large amounts of ozone. Well over the FDA recommended maximum. To be fair to Vollara, Ecoquest, or whoever they are now, the owner's manual does stress to set the room size correctly and never use away mode in an occupied room. Ozone can cause more irritation than it supposedly removes. If you have asthma, DO NOT buy or use an ozone generator. Customers complaints about the Living Air ionizers have increased. In response Ecoquest has added features to the Ecoquest air purifiers. They have added a UVC light to these units. This has 2 problems. The first is that it is only 4 watts so it is not very powerful. We doubt it actually does much good. The second is users have complained the light can be seen through the front of the purifier. A pre-filter was added to the air intake. It will filter out and remove larger particles from the air. Later a filter claiming to be HEPA like was added. The ozone production is adjustable, which is an advantage, we guess. These machines are 9 x 12 x 12 inches and weigh about 16 pounds. They come with a 3 year limited warranty. There are a wide variety of complaints out there about these air purifiers. "I ordered my Living classic in Jan 2009 and it broke 3 months later...they said no warranties or refunds"
"I stopped using the 2 that I have a few years ago. Eye and nasal irritation were constant"
There are also complaints of the machines breaking down. There are many positive comments about these purifiers also. We tend to think dealers are leaving them. We think that the Living Air ionizer air purifiers are not worth it. They are very expensive for what you get. For the same price you can buy a very effective IQAir air purifier. For the price of a Living Air you could buy a commerical ozone generators that will produce much more ozone. Ozone does do a fantastic job of removing odors. It gives you a fresh air smell that is hard to beat. If you use an ozone generator, use it in an unoccupied room and air it out before it is used. We feel this company is focused more on building its pyramid of related dealers. Customer satisfaction and safety take a back seat. We cannot recommend this to anyone. There are much better alternatives out there. Read the air purifier reviews on this site to find many safer alternatives to an ozone generator. Leave Living Air Ionizer Page and Return to All About Air Purifiers Home Page.